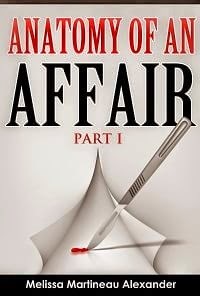 Melissa Martineau Alexander’s “Anatomy Of An Affair: Part I” is a suspenseful romance novel that explores the development of a woman’s affair with her husband’s best friend. The protagonist, Lily, is a thirty-something who has it all – a beautiful daughter, a loving husband, a great job – yet has an affair. Rather than sweep the whole thing under the rug, Lily dissects the development of the affair, from first meeting her lover to their intimacy. One of the things I love about this book is how the narrator doesn’t point the blame for her affair and move on. Rather, she carefully examines everything that led to the affair, from her childhood to her earlier relationships to her marriage, with the hope of learning from it. The book is written in first-person with a very conversational style, which makes you feel like the narrator is right there talking with you. It is fascinating to learn every little detail of Lily’s life (some very surprising) and how they contribute to her actions. The author writes characters, especially Lily, Nick, and Kyle,with such developed back-stories that they seem like people you’ve known for awhile. Recommended for anyone who enjoys character-driven stories with suspense and romance.